Scientists from Tohoku University and the High Energy Accelerator Research Organization have developed a new complex hydride lithium superionic conductor that could result in all-solid-state batteries with the highest energy density to date. The researchers say the new material, achieved by designing structures of hydrogen clusters (complex anions), shows markedly high stability against lithium metal, which would make it the ultimate anode material for all-solid-state batteries. All-solid-state batteries incorporating a lithium metal anode have the potential to address the energy density issues of conventional lithium-ion batteries. But until now, their use in practical cells has been limited by the high lithium ion transfer resistance, caused mainly by the instability of the solid electrolyte against lithium metal. This new solid electrolyte that exhibit high ionic conductivity and high stability against lithium metal therefore represents a real breakthrough for all-solid-state batteries that use a lithium metal anode. "We expect that this development will not only inspire future efforts to find lithium superionic conductors based on complex hydrides, but also open up a new trend in the field of solid electrolyte materials that may lead to the development of high-energy-density electrochemical devices," said Sangryun Kim of Shin-ichi Orimo's research group at Tohoku University. All-solid-state batteries are promising candidates for resolving the intrinsic drawbacks of current lithium-ion batteries, such as electrolyte leakage, flammability and limited energy density. Lithium metal is widely believed to be the ultimate anode material for all-solid-state batteries because it has the highest theoretical capacity (3860 mAh g-1) and the lowest potential (-3.04 V vs. standard hydrogen electrode) among known anode materials. Lithium-ion-conducting solid electrolytes are a key component of all-solid-state batteries because the ionic conductivity and stability of the solid electrolyte determine battery performance. The problem is that most existing solid electrolytes have chemical/electrochemical instability and/or poor physical contact against lithium metal, inevitably causing unwanted side reactions at the interface. These side reactions result in an increase in interfacial resistance, greatly degrading battery performance during repeated cycling. As revealed by previous studies, which proposed strategies such as alloying the lithium metal and interface modification, this degradation process is very difficult to address because its origin is the high thermodynamic reactivity of the lithium metal anode with the electrolyte. The main challenges to using the lithium metal anode are high stability and high lithium ion conductivity of the solid electrolyte. 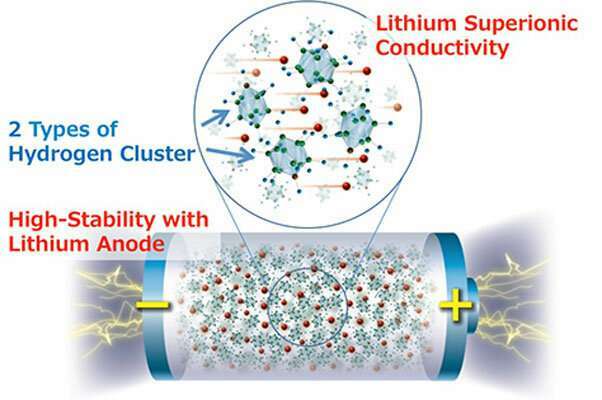 "Complex hydrides have received a lot of attention in addressing the problems associated with the lithium metal anode because of their outstanding chemical and electrochemical stability against the lithium metal anode," said Kim. "But because of their low ionic conductivity, using complex hydrides with the lithium metal anode have never been attempted in practical batteries. So we were very motivated to see if developing complex hydride that exhibit lithium superionic conductivity at room temperature can enable the use of lithium metal anode. And it worked." It's not quite there yet. The ionic conductivity is quoted at 6.7 mS/cm at 25 °C. This is around 10% of the conductivity of the liquid electrolytes. In other words, no fast charging or rapid accelerations for these batteries - if a normal battery can handle half an hour to charge, this one would need five hours - and it gets worse at colder temperatures. Though if you heat it to 50 °C you get very nice properties: 2500 Wh/kg at 1-3C charge rate. That appears to be without any cell packaging though, so the practical figures will be lower - especially since you need to add a heater for the battery to work properly. slowly working our way to making explosives at the molecular level. The two will be largely synonymous. Convergence. One will beget the other. Erm...you do know that all explosives (exception fusion/fission) work at the molecular level?